The NetherRealm Studios has delivered its masterpiece with the second installment, Injustice 2, which is very good for the critics and the ratings. In this guide, we would like to give you tips on the different modes, the level system and the equipment. Even if you prefer to jump directly into the online battles, you should definitely play the story mode. Because between the 76 battles that await you in the action, the developers have an epic story to tell, which is presented in about 150 minutes in excellent animated sequences. - After each of the twelve chapters, your epic level 20 equipment will unlock for your fighters. You can only wear it if the hero has reached level 20, but you should not miss the new costume because they also improve the values and abilities of the characters. A perfect preparation for online battles against other players. - Within the individual chapters you always play one or two heroes. For a duo like Black Canary/Green Arrow or Firestorm/Blue Beetle. You must decide before a fight, who should fight. But don’t worry you can repeat fights later in the chapter selection so that you can catch up on alternate storylines quickly to reach the 100% storyline. The multiversum simulation is separate from the story mode and represents a series of challenging missions, which change partly every hour, daily or weekly. In doing so, you are monitoring alternative realities with the DC heroes and intervenes where danger threatens. 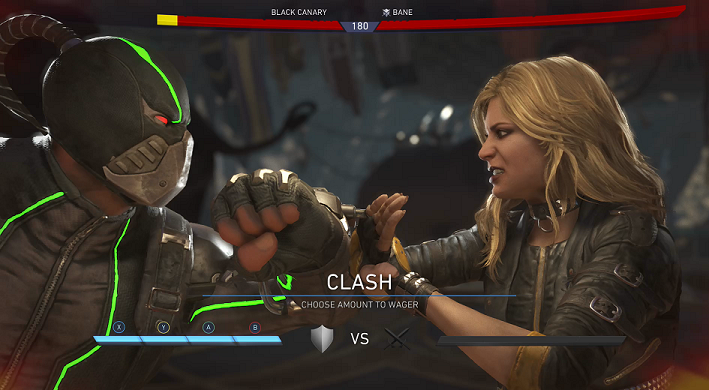 The mode is best compared to the living towers of Mortal Kombat X. You will see the required level for each event and which rewards you. The multiverse should always be your starting point for fast matches, because you will get the best equipment in the game, so you can increase your chances in multiplayer against other players. The Loot boxes in Injustice 2 are called mother boxes and they are available in various grades from bronze to diamond. These will always be rewarded for certain missions and challenges. It is important to know that they are connected to the level you are given. This means that a mother box that you receive at level 5 will always have the appropriate equipment, even if you open it at level 20. So it makes no sense if you spare up the mother boxes. Always open them directly when you receive them because they don’t level with you. - You gain access to special multiverse challenges, where you have to meet a common goal. - You also earn guild points to unlock your mother boxes, which are only available to guilds. So if you get more loot, you should definitely join a guild as soon as you reach level 5. In the game, it may also happen that you have to choose an ugly but better armor at the expense of the more visually nicer with worse values. But there is a practical solution, because you can transfer the appearance of certain equipment to others. Using the appropriate menu you can perfect your characters so visually according to your wishes. The only reason for this is that the transformation process costs you the in-game currency source crystals, which you can buy for real money. However, you sometimes earn it in the game. You get about 500 source crystals, when you finish the tutorial, do not forget! In the course of the game, you will be filled with tons of equipment, of which you can sell the gray armor parts directly. This gives you valuable in-game currency that you can use to improve your equipment. In addition, your inventory is limited, so be careful. To upgrade your equipment you get so-called rain tokens in the course of the game. You can spend this to place a piece of armor on the level of your hero, thus improving its values. We strongly recommend that you use the toes only for epic armor (golden color), and only when you reach the maximum level with a hero (level 20). As in the first Injustice, you can also initiate a clash in battle in the second installment, where both opponents collide in the middle of the screen and you can risk a part or the whole action bar to get back health or to deal damage. You can only start a clash if your second life bar has already been opened. By pressing R2 / RT arrow key towards the opponent you can start a clash. In doing so, the timing is crucial and can turn the booklet completely into your favor in a fight. Pimp out the last holes, but your action bar is full? Then start a conflict and get your life back instead of a super action. You have to fight yourself, you can build a team of three heroes and make them available as opponents in the combat simulator for other players. In doing so, the AI takes control of your characters and gets rewards for you. You will get even loot boxes even if your team continually defeats, so you can only win here and get more loot. If you want to have better rewards, of course you can create spoiled hero teams with better equipment, making it harder for the other players. The assigned fighters can still be used in other modes. First you should familiarize yourself with the different fighters in the game and try them out. You will quickly notice that some of them are better off than others. Therefore, first concentrate on these heroes and try to internalize their maneuvers. Then if you level them up properly and equip them, this is the best prerequisite for playing online against other players.